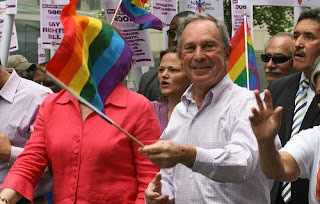 Mayor Michael Bloomberg, to his credit, stated there was no room for the intolerant attitudes sported by the GOP gubernatorial candidate. "We're a melting pot here in NYC," stated the mayor. "We don't care where you come from, or what your sexual orientation is. We have respect for absolutely everyone. Except public school teachers. That's why we gave all city employees raises except for them." When asked whether that statement was discriminatory, the mayor sharply disagreed. "We don't discriminate against teachers," he insisted. "Whatever color they are, whatever religion they practice, whoever they spend their time with, we treat them all the same. We don't get any input at all from them on how to run our schools, but blame them completely when our reforms blow up in our faces. Hey, don't get on my case about it. Go watch Waiting for Superman. Watch Oprah. Everybody's doing it." Several public school teachers, personally interviewed by our crack staff at NYC Educator, affirmed the veracity of the mayor's words. "Yes," said one, who spoke on condition of anonymity. "Mayor Bloomberg really does treat us all like crap. Not just some of us. He doesn't talk to us and he doesn't care what we think. In fact, he doesn't even negotiate with us. He announces to the press he's giving no raise, even though the Taylor Law requires him to negotiate in good faith. He says that's to prevent teacher firings, but then Klein says they're going to fire teachers next year anyway." When asked whether the chancellor harbored any prejudice, the teacher shook her head in disagreement. "He treats us like crap too," she assured us. "Every last one of us."